In Episode 95 of Inside the Marketplace, Priest spoke with Dr. Bee and then again in Episode 99 when Priest spoke with Vadim Fedorovsky about the CBD and Marijuana business and even some of the important details of what the differences between CBD and Marijuana are and complexities of dealing with decades of anti-marijuana messaging. Millions of people have been locked up or fined for marijuana. In recent years more and more states are legalizing marijuana and the effects of which have been positive both in tax dollars raised and crime reduction. For decades marijuana was disparaged and treated like some harder drugs – even being treated as such by the government, keeping it in the most restrictive class of drugs, Schedule I, which classifies it as dangerous right along with Heroin, Ecstacy and other drugs. This classification makes it much easier to throw harder federal charges at users and dealers and thus we have a ridiculous number of people arrested every year. In 2016, over 650,000 people were arrested for marijuana charges. 89% of those were busted for possession alone. 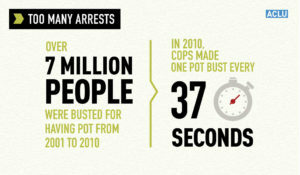 From 2001-2010 over 7 million people were arrested for pot. It’s just not an acceptable number for a drug that has no business being on Schedule I and really has no reason for the persecution behind it. There are a number of other stats that might call a lot of different thoughts into play here. Like, who uses the drugs? Well according to the ACLU, Whites and Blacks are almost equally as likely to be the users but Blacks are arrested FOUR times more often. It’s not unlikely that some racial overtones are in play here. However keeping marijuana illegal has really another, much larger benefactor: Big Pharma. You see as it turns out, when people use marijuana or CBD oil, they get better relief and don’t need to take all of the prescription pills they have been over-prescribed through the years. They even stop taking over the counter pain meds. That scares the heck out of pharmaceutical companies who need you to need them. If you can grow this yourself or through someone you trust or have easy cheap access, why would you ever spend insane amounts of money on drugs that are marked up to exorbitant rates that people can’t afford? I mean hey, you can of course stay with meds made by companies that helped Pharma Bro Martin Shkreli buy the latest only copy ever of a Wu Tang Clan album if you like, but most of us have bills to pay and mouths to feed so it’s just not a good option. One such company called Insys spent $500,000 to stop a medical marijuana bill in Arizona. Their efforts were successful unfortunately and they were able to shift focus to what their real plans were all along… to sell cannabis based products themselves. That’s right, they fought to stop legalizing marijuana so they could then corner the market for themselves. We all know how cheap lawmakers are these days. You can easily buy a former Speaker of the House and get them to change lifelong opinions on weed if you have the right amount of money. The good news is the tide has turned. Legalization is more popular than ever at 61% in January of 2018, almost double of where it was in 2000. More states are legalizing marijuana every year. Some legislators who have been against this tide have tried red tape tactics to slow the role. Governor LePage of Maine tried to veto legalization only to be overturned by the legislature. Other states have been very, very slow in rolling it out. Massachusetts is just about to begin rolling it out despite voters passing it in 2016. In some states like Michigan where medicinal marijuana has been legal for years, they have pulled a variety of tactics to try to push full legalization referendums off the ballot to attempt to prevent voters from voting for the inevitable only beginning to relent recently when they came up with a cynical way to tie legalization to an income tax reduction that hurts the state. Likewise they worked to make it very restrictive for recreational marijuana users by instituting a new mouth swab on drivers suspected of using weed to try to prove it’s in your system and charge you for driving. This despite their own admission that just knowing if it’s in your system cannot prove level of impairment and you know the whole counter argument that marijuana legalization has actually pushed traffic deaths DOWN (Michigan police tried to cite a stat showing drugged driver increase but purposely did not separate what types of drugged drivers the stat included so it could have been someone on meth, heroin, even prescription drugs that the stat they used referred to). The link above should break it down. Make sure you take note of the variances in the laws. CBD derived from marijuana itself creates a whole bunch of hoops to jump through and pitfalls to avoid. Check each state out and determine what you can or cannot do in your area. Likewise, Where is Marijuana Legal? This list is likely going to move even faster than the CBD list with the 2018 mid-term elections coming up nationally in November. The difference between medical and recreational marijuana is huge. Also, decriminalization isn’t necessarily a get out of jail free card so in states where it is illegal but where some cities aren’t looking to arrest people with small amounts of pot you still want to be careful. Until everything is legal play it safe, do your research and find the best possible option for you.